It would be wonderful to imagine all Sikhs stand for justice but sadly that is not the case. 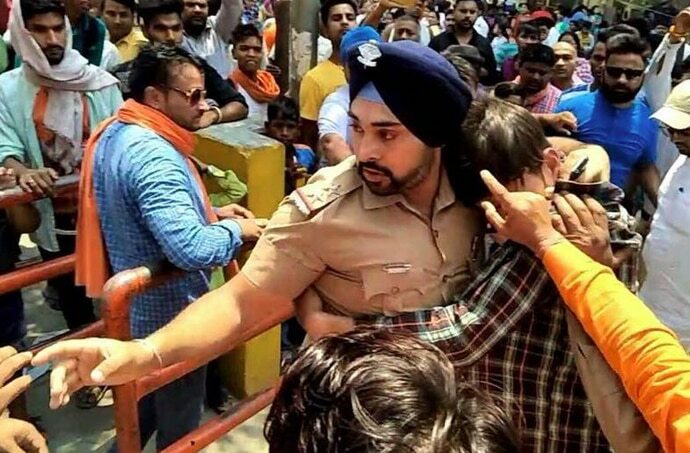 Over the last day, sub-inspector Gagandeep Singh, Uttrakhand Police, has done much for the image of Sikhs and the police force. In the immense sharing of his photograph and deed – saving a man from a mob – I see a celebration of a certain kind of heroism which should be basic for all our security forces. The forces exist so that this is normal, routine work, not heroism. Please note I completely commend Gagandeep and am proud for him but let us look beyond. No doubt, our distrust comes from recent Thoothukudi, from Gadchiroli, Hashimpura, Bastar, Kashmir, Punjab, North-East... the list is endless. In fact, we need to look at no list. For me, growing up in Punjab in the 1980s - when we didn't know who were more dangerous the police or the militants – even now the sight the khaki uniform makes my heart miss a beat. We need to look at how many women I know tell me a standard instruction they receive in life: if in a tight spot at an odd hour do not go alone to the police station. During India’s independence movement out of 121 freedom fighters given the death sentence three-fourth were Sikhs – 93. Out of 2,646 freedom fighters sentenced to life imprisonment in Cellular Jail four-fifth were Sikhs – 2,147. Out of roughly 1.5 lakh people arrested during Emergency, half were from Punjab alone. It would be wonderful to imagine all Sikhs stand for justice but sadly that is not the case. That is why perhaps while Gagan's story is travelling the English social media and news sites, I do not see it being reported enough in Punjabi. Look at Punjab now. Look at its collapse of police system evidenced by the recent case – hushed up – where senior police officers were speaking in court against each other. Look at the police system's collapse that now Punjab chief minister has asked for central forces to guard its jails. There are a million such instances. As a nation-state, we need to ask what have we done to the sense of justice by which the Sikhs are known to stand? As a nation-state, we need to ask what have we done to our security forces? To me, Gagan's own act of heroism needs to inspire us to go beyond it – start real discussions, call for real change, not just end with praise on social media. That would be our true tribute to him.